Over at Bitmob, Andrew Hiscock has put together this delightful "Choose Your Own Adventure" text-based adventure. The difference between this CYOA and the ones you may have read as a kid is that this one takes place… in Gamestop. Well, technically it takes place in "The video game store," but I think we all know what that means. You'll need a die to play the game and randomize some things. Andrew suggests a 20-sided die, but it's playable with a regular six-sider. This is great stuff, and the possibilities for future stories are limitless. "Good day," the man says in a high voice that belies his girth. 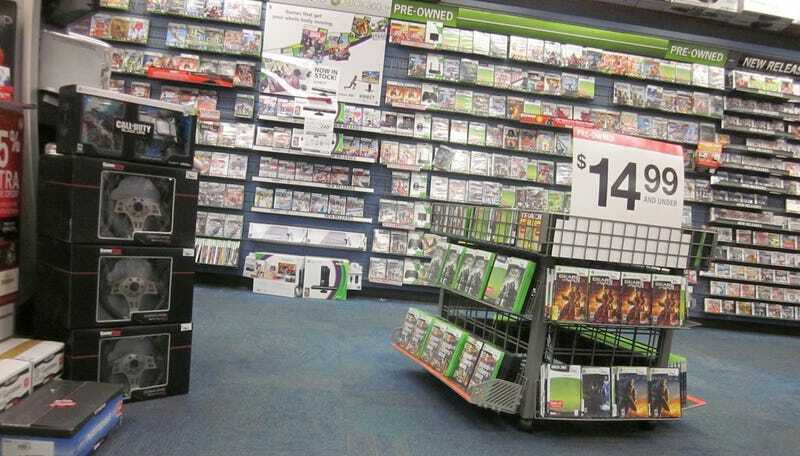 "Welcome to Video Game Store, where you can trade all your games for a new game! Can I interest you in a pre-order to reserve a copy of a game that may or may not be guaranteed?" Now to be fair, I was just in Gamestop yesterday and the gentleman who helped me at the counter was nice, helpful, well-groomed and -spoken. But hey, I'm not the one telling the story. Hopefully we'll see more of these... might I suggest one set at E3? "Choose Your Own Adventure: The Video Game Press Event."